New Hyde Park native Joshua Snider broke his leg on Christmas Eve while hiking in Big Bend National Park in Texas, where emergency services were limited because of the government shutdown. 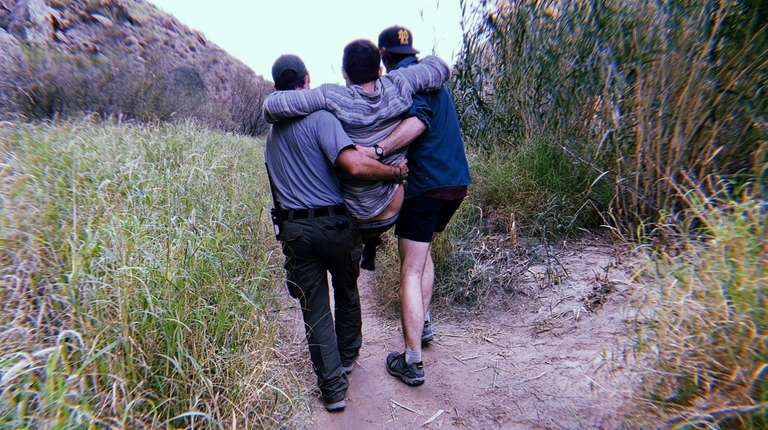 A former Long Islander is grateful that several Good Samaritans and a park ranger came to his rescue after he broke his leg while hiking Christmas Eve in a national park in Texas, where the government shutdown limited emergency services. Joshua Snider, a native of New Hyde Park who now lives in Austin, Texas, had invited his friend Michael Bright to spend the holidays on a three-day hiking trip with him at the 1,252-square-mile Big Bend National Park in southwest Texas. After hiking and camping for two days, the two friends hiked to the end of the 1.7-mile Santa Elena Canyon Trail around 2:20 p.m. on Dec. 24. There, Snider slipped on a rock while climbing about 6 to 8 feet up boulders and tumbled down into the water below. The fall fractured his fibula and tore several ankle ligaments. Injured, cold and wet, Snider was helped to the river bank by Bright. As the two tried to figure out what to do next, a family of four came by and offered their assistance. Park services later told them emergency responders were not available to help Snider due to the shutdown and limited staff. Despite the news, Snider said he was focused only on trying to get to safety. “I was just thinking, ‘Let’s get out and let’s get going because I am cold and tired and I want to go home,’ ” he said. The family and Bright carried Snider back along most of the 1.7-mile trail, when they met up with a park ranger working unpaid that day. Identified only as “Matt,” the ranger carried Snider on his back for the rest of the two-hour return to the start of the trail. Bright then drove Snider to Big Bend Regional Medical Center in Alpine, Texas at 7 p.m. Christmas Eve. Snider flew to New York City on Dec. 26 for surgery. A message on the national park phone said officials were not available because of the shutdown. Now back at his family’s New Hyde Park home after a successful surgery in Manhattan, Snider, whose leg will take at least three months to heal, said despite his injury and the problems the shutdown posed for him, he was moved by his rescuers' compassion and kindness.